Dare we scorn His grace for Satan’s lies? Dare we break His heart that loves us so? Crucial questions for you and I right there at the end! Hope you answer them now and do so correctly. You are blessed in Jesus’ name. Nice poem ma. May the remembrance of the birth of our Lord Jesus Christ help all Christians to live a life worthy of emulation because we are His representatives here on earth. This is the beginning of seasons leading to time and time is understood as no more. strengh,joy and love to all thebsojourners of the most high God. hugs with love my sister in Christ Jesus our teacher of salvation. Bless you my brother, The Sojourner! Thank you, Vivian! Glory to God! First, I will say that the title of this poem is interesting. Like what Vivian has said, I jpray that the birth our Lord Jesus Christ will bring joy as we celebrate Christmas and it will teach us the need to hold on to God's grace and not breaking his heart. Praise God! Hope you had a lovely celebration. The birth and death of Jesus Christ are two very significant events in the Christendom. His birth brought us hope. It gave a sense of belonging. His death which is better felt vicariously, gave us salvation. It granted us untrammeled access to the father. Formally, we wondered like sheep without a Shepard. All thanks to Him for the work of redemption. It is pertinent to note that no amount of Thanksgiving is commensurate with God'slove for making. But then, we can only reciprocate his wondrous deeds for us by replicating his virtues, for as he is in heaven, so we are on earth. You're right, Gideon, and so blessed! Nice. The birth of our saviour might have happened two millennium years ago but I pray that man cherishes this gift of a Saviour from God. Merry Christmas. For behold,I bring you good tidings of great joy,which shall be to all people LUKE 2:10 The birth of Jesus brought salvation, his birth made us believe that we are Christlike . The Christmas celebration is as a remebrance of Jesus Christ birth that God sent his only begotten son to save mankind. Nice poem I must say. May the celebration bring upon us joy,love,peace IJN AMEN Merry Christmas and happy new year ahead. Amen to your prayer and wish you the same. To be sincere I still can't seem to fathom how a star could announce someone's birth. I guess that's just how mighty he is. Yes I've scorned his grace for Satan's lies, yes I've also broken his heart even though he had paid sin's grievous price, many years ago. Well, it's not too late to do something about it. I think at some point we've all scorned God's love and broken His heart, but thank God for His forgivess and redeeming love. Beautiful poem sister. Thank you, woman of God! May His grace keep us from constantly breaking His heart in Jesus' name. I have broken his heart oo... Seriously if God were to take these things seriously, hell will be quite small. But his grace and mercy abounds and that's why I press on each day to subdue the power of my flesh so that as a Christian, I may truly live like Christ. So should we all. Bless you, Kingston! I love this poem.The transition is awsome & the closing is nice too; those are very important questions that we all need to answer. Yes, every single one of us need to. Me too! This last one was really fun. We longed for a saviour, a redeemer who will set us free from the grip of the evil one. We cried. We perished. we were subjected to all manner of torture by the evil one. Then He came, to redeem man from sin, from the captivity of Satan. He was crucified, He died that we may live. He suffered on our behalf. He died our death. The death that was due for us was what he took upon Himself. All these He did that we may be free from the evil one, but the question remains, "have we rejected the devil?" Wow! Collins, you know the Gospel like this? Na wa oh! The question you asked in the end really bears answering. All day, they kept telling us that Christ is coming soon. But if He comes today, what will be our fate? Scary, isn't it? May God help us to fully reconcile with Him and live right in Jesus' name. The poem is about the birth and death of Christ. His sacrifice for us is the more reason we should love him more. May we love Him more indeed everyday in Jesus' name. Thank you, Faustina! You are blessed! Not by power or by might but by His grace! Thank you. All glory to God! Abundant grace to you too in all you do, Emmanuel! You are richly blessed in Jesus' name. I am grateful too. Stay blessed, Mercy! A nice poem ma. May God give us the grace to live up to expectations as Christians and represent christ well here on earth to the glory of His name. I know this is a seasonal poem. It centers on Christmas, but then the last two lines of the last stanza seriously caught my attention as I read it. This is what came to my mind, "The joyous coming of THE SAVIOR seems to be turning out sorrowful to some of us, relating it to our attitude towards the things that concern this same person called CHRIST". My prayer is that He will help us to come to the full knowledge of Him and to realise why He has actually called us His own and what He wants us to be like. Thank you, ma. It's an awesome poem. To me it's so touching, especially those two lines I mentioned. Well done! Wow! This poem is really touching. At first it made me uncomfortable because we have rejected a great King who has come to pay for our redemption. For me I want to turn a new leaf. I don't know about you, my friends. I think you should do the same. Beautiful decision and great advice if by turning a new leaf you mean accepting Jesus Christ as your Lord and personal Saviour. You are blessed! Having sacrificed his life for the salvation of the world, we really owe our lord Jesus Christ a lot. We must try to deviate from our bad ways and turn a new leaf in appreciation for what Christ has done for us. Lord give us the grace to keep the faith even in this perilous time and season, so that when you come again in glory we shall not be found wanting. Amennnnnnnnn! Wonderful prayer. Amen and amen in Jesus' name. You are lifted, ThankGod, in Jesus' name. Oh how I want to make His heart happy! Beautiful poem with convicting questions at the end. God bless you, Juanita! All glory to His name. I love this poem! My favorite line is "Lo, an angel’s light rent the darkened sky." It reminds me of the words from the carol Silent Night, which says "with the dawn of redeeming grace." The light of angels, the light of the star, and the light of the presence of Jesus incarnate broke through the dark universe, and grace and hope was birthed! Glory to God! Thank God we are partakers of that grace and hope. Bless you, Susan! KEEP WORKING FOR HIS GLORY AND GRACE BECAUSE HIS LOVE, CARE AND PROTECTION LAST FOR EVER. MAY GOD REMAIN WITH YOU IN JESUS NAME. Amen. Thank you, Delise. 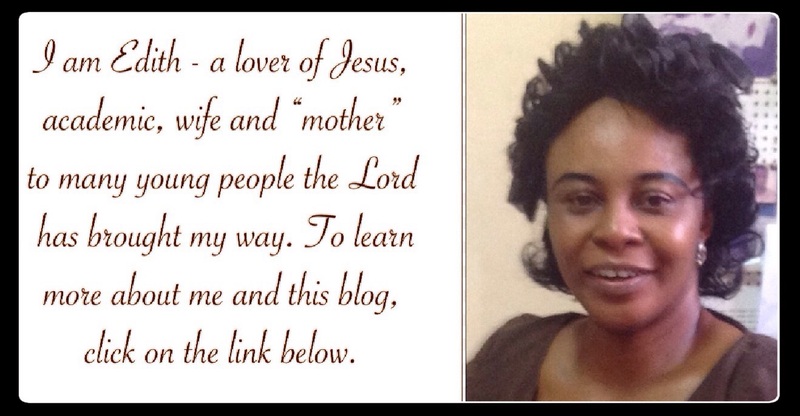 May God bless you richly in Jesus' name. 'ABIDE WITH ME, FAST FALL THE EVENTIDE, THOUGH DARKNESS DEEPENS, LORD WITH ME ABIDE.....HELP ME NEVER TO TAKE FOR GRANTED YOUR SACRIFICIAL EFFORTS TOWARDS MY REDEMPTION. IT WAS AND IS NOT EASY, BUT IT WORTHS IT'. I dare not break his heart. we are humans and may say that we are prone to mistakes, but with his grace and bearing in heart and mind what Jesus did on the cross, I think love for him will restrain us from doing certain things. Its still by His grace that we do not break His heart.. just remembering some mistakes of the past and still He forgives us. indeed He is God! may the birth and death of Jesus Christ continue to serve as a true reminder to us of the price he paid on the cross of Calvary. I pray God give us the grace to understand what Christmas really means.....then no one would dare to break the saviours heart. A happy new year to you ma. let's always pray that by His special Grace alone, we would all be able to be upright with Christ in all our doings. Christ has paid it all on the cross. we should pray for grace everyday to enable us be upright with Him and not break His heart. He has already been crucified once, so let's not crucify Him again with our actions. Blessed 2018, momma!!!! We are bt humans, we can't keep the promise on our own, we need his grace to be strong against temptations and know the right way to Christmas so as not to disappoint and break his heart. Nice poem to sum up the reason for His birth. my prayer is that we should always pray for His Grace to abide with us so that we will never lose focus of the reason for His coming which is the greatest gift of God to mankind. Nice poem ma, the truth is that, Yes I've scorned his grace for Satan's lies, yes I've also broken his heart consciously and unconsciously even though he had paid sin's grievous price many years ago for my sake. I pray for God's grace in my life and the lives of all his creation that we will not break his heart no matter Satan's lies. A poem which makes me appreciate literature,art, Jesus Christ and Christmas all at once.The rhyme scheme is perfect(ABABACDCDCEFEFE).Three mind blowing stanzas and 15solid lines of rich and powerful words that could change a man's heart forever. I read it over and over again. Need I talk about the poem's caption?or the unique graphical illustrations? One word for Aunty Edith! Awesome!!!! Most times, I unconsciously reflect on how difficult it was for God as a father to send and allow His only beloved son to die for people who never deserved him and how difficult fo Christ himself, to leave his royal position as a king and prince in his father's kingdom just to come down and take our human form in order to die and save: us from sin and condemnation. This is how much they both love us and yet, we dare break their hearts. I only pray our eyes will be opened more to see and appreciate their great love for us. His life sacrificed on the cross gave man life in him abundantly. Even though this sacrifice was done over two thousand years back, the power of the blood is still working to save man. Jesus Christ was born, suffered and died a painful death on the cross for our salvation. Come to think of this, how many Christians are willing to make this kind of sacrifice? The door is now open to us, accept him and never stop thanking him for saving us. Dear God, please give the grace to stop breaking your heart in all my deeds. am touched. dare I beak his heart after the sufferings he went through for my sake. It is only the grace of God that is sufficient. This post is really touching because I know sometimes my behavior makes it look like I don't value God's greatest gift. for through his birth we have hope; through his death on the cross we all are saved from our iniquities. Glory be to his name. For God so loved the world that he sent his only begotten son that whoever believes in him shall not perish but have everlasting life. Glory be to his name. Learning of and seeing all the sacrifices God has been making for the redemption of mankind, it should be difficult to dare to break his heart. However our contemporary world of today, seem not to agree with this. Annoying God through the words of the mouth and our actions, have become a norm. May God give us the grace, to carry on in this work of faith. Amen. 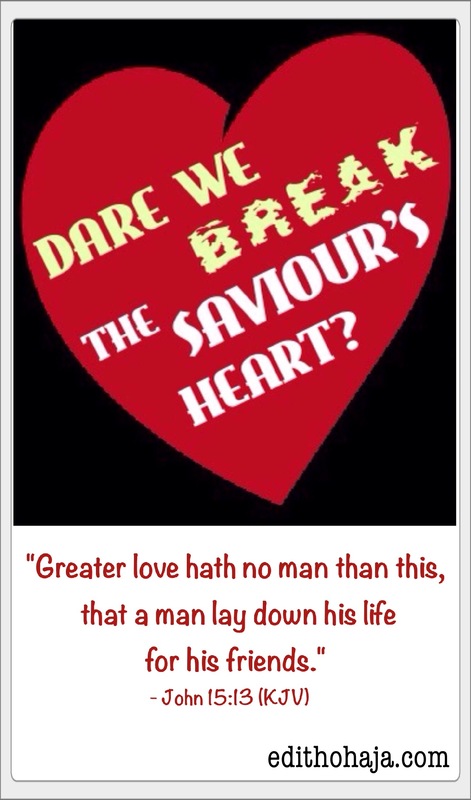 Despite all his love for us we still scorn the saviour and break his heart, thats because we are mere mortals, we need his grace to avoid our sinful lives and realize that no one dares break the saviour's heart. I really love this poem. This is a food for thought unto all. Let's never take His love for granted. It's quite unfortunate that from the Garden of Eden, man has been sinful. God keeps being abundantly merciful. May we make heaven at the end of our sojourn on earth. Amen! The birth of Christ that brought us happiness, joy, peace and cleansing of sins. We should endavor not to betray this love. We shuld strive to live up to the kind of love he was born to give.. Jesus Christ is the son of God born to the world. this is good for his remembrance. Very touching. Jesus did all these for us. He paid the costly price for our sins. He trusts that we whom He has saved will not disappoint Him. The cunningness of the evil one should not lure us. We should be with Him who gave up life for us. For our sake he was born. For our sake he became His creature. For our sake he died. Yet He lives. He lives to see us, the fruit of his blood. May we be His forever. Its appalling that we break Christ's heart all the time. Despite the fact that He gave His all to save us from eternity but we still keep on in our sinful ways. We pray that He forgives our sins and lead us to life ever lasting. Is really disgusting that many still crucify jesus the second time with their evil deeds ......despite the fact he has given the highest sacrifice by dying on the cross just for our sins. Christ did what no man can do. HE paid the price we couldn't pay. Help us Lord to know and worship you more and more. Sure we do break his heart. Just because we humans love the things of the world and we believe so much in them. This saviour whom we hurt so much keeps loving us everyday. His love is unconditional. If only we can see that the things of this world is all vanity and we appreciate the good deeds of our Lord Jesus Christ, we all shall be saved. Thank you so much Ma for sharing this here. God bless you.